Day 1: Thursday night, May 27, 4:45 p.m. to 9:15 p.m.
Day 2: Friday night, May 28, 4:45 p.m. to 9:15 p.m.
Day 3: Saturday morning, May 29, 9:45 a.m. to 2:15 p.m.
Day 4: Sunday morning, May 30, 9:45 a.m. to 2:15 p.m.
One 4-hour workshop per day. All 4 days are for serious-beginner to upper-intermediate levels. Famoudou is adept at combining different levels in one group. Each day is self-contained, and different rhythms will be taught each day. Bring your djembe. There will be about 40 dunduns (bass drums) available for workshop use, but if you want to be sure we don't run out, bring one bass drum (Dundunba, Sangban or Kenkeni) and 2 sticks with you. 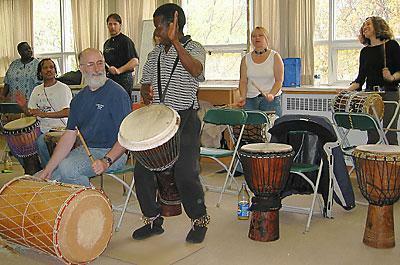 All participants will learn and play the bass drum parts as well as the djembe during the workshops. Youth participants are welcome, but should be serious students no younger than 10 years old. No video-recording. Audio-recording is permitted for participants' personal use. Instructional content is not to be published, re-distributed, broadcast or web-posted without Famoudou Konate's written consent. No auditing or observation during the workshops. Total workshop size is limited, so advance registration is strongly encouraged. No personal checks accepted after Thursday, May 20--money orders, cashier's checks or cash required. Cash only at the door. Cancellations requested after Thursday, May 20 subject to $20-per-workshop cancellation fee. No refunds on or after the day of the workshop. Print out, fill out and mail with payment. Special rates at the Ramada Inn Lakeshore, less than a mile from the workshops! We usually have Famoudou's CDs available for purchase at the workshops. Cash sales only. 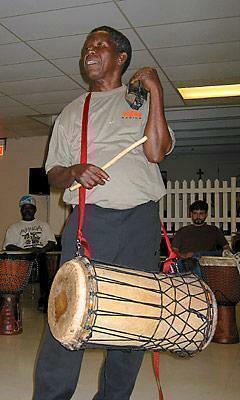 Famoudou usually brings djembes, and sometimes dunduns and other musical instruments from Guinea for sale. Check with CDP for availability closer to the workshops. Cash sales only.